At the annual UN General Assembly meeting held in New York, presidents from around the world have the chance to state their views on the key international issues of the day. Not surprisingly, the crisis in Syria, Iran's pursuit of nuclear weapons and the Millennium Development Goals took center stage this year. Yet a careful viewing of the speeches of the Latin American presidents illustrates the growing voice of Latin American leaders calling for meaningful reform of drug control policies. Across the region, a dynamic debate – focused on the failure of present drug control policies to achieve their desired objectives and the need for more effective and humane alternatives – is underway, most recently evident in an innovative report on drug policy released by the Organization of American States (OAS) and the Declaration of Antigua from the June 2013 OAS General Assembly meeting calling for an Extraordinary Session focused on drug policy to be held in 2014. Last week at the UN, Colombia, Costa Rica, Guatemala and Mexico united in bringing this regional debate to the General Assembly meeting, calling for consideration of alternative approaches to the drug issue, and for the efforts underway within the OAS to be used as tools for debate within the UN in the lead up to the UN General Assembly Special Session (UNGASS) on drugs to be held in New York in 2016. The governments of Costa Rica, Guatemala and Mexico all called for developing more effective responses to drug trafficking based on promoting public health, respect for human rights and harm reduction. (Interestingly, all three countries used "reducción de daños" in their speeches, or harm reduction in English, though it was translated into "impact reduction," "lessening damages" and "damage reduction" in the three speeches respectively.) In doing so, they essentially called for a paradigm shift – from a security approach to a public health and human rights-based approach – in dealing with issues related to illicit drugs. At the same time they recognized the need to reduce the levels of violence associated with the drug trade and reiterated a growing call from the region for increased international efforts to decrease the illegal flow of arms and money that fuel criminal networks. Finally, they united in calling for an open and wide-ranging debate leading up to the 2016 UNGASS, and pointed to the Declaration of Antigua of the General Assembly of the OAS as a "first step which leads us to the desired direction" towards the 2016 UNGASS. Mexican President Enrique Peña Nieto could not attend the UN meeting because of the two hurricanes that recently ravaged his country. Nonetheless, the speech given by the Mexican Foreign Minister, José Antonio Meade Kuribreña, is the first indication that recently-elected President Peña Nieto is assuming the international leadership role on drug policy bequeathed to him by his predecessor, Felipe Calderón. At the September 2012 UN General Assembly meeting, the presidents of Colombia, Guatemala and Mexico issued a formal statement underscoring the need to "review the approach" of present drug policies and calling on the UN to "exercise its leadership… and conduct a profound reflection to analyze all available options, including regulatory market measures, in order to establish a new paradigm that prevents the flow of resources to groups involved in organized crime." As a result of their efforts, it was announced that an UNGASS would be convened in early 2016 on the "world drug problem." Since taking office in December 2012, President Peña Nieto has repeatedly said that he is not in favor of legalization but supports drug policy debate. However, until Mexico's Sept. 26 speech, he has said little else on the issue and his government has kept a low profile in the OAS and other regional forums where drug policy has been discussed. Now President Peña Nieto has cast his lot with fellow presidents calling for a new approach to drug policy. Guatemalan President Otto Pérez Molina went furthest of all in his comments, both in his address to the UN and in a separate speech at Columbia University. At the UN, in addition to the statement coordinated with Costa Rica and Mexico, President Pérez Molina commended the "visionary decision" of the citizens of the States of Colorado and Washington on their recent enactment of legal, regulated marijuana markets, as well as President Obama for his "wise decision of respecting the voice of the citizens of Washington and Colorado, to allow these innovative experiences to provide results." 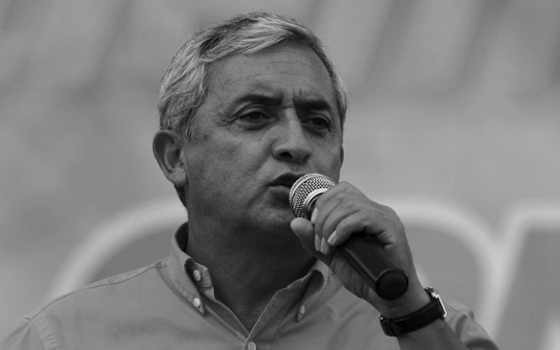 He also added that the people of Guatemala "respect and are proud of" the government of Uruguay's actions in proposing legislation regulating the cannabis market instead of "following the failed route of prohibition." He emphasized the importance of experimentation with new models by each country to address the drug problem and announced the creation of a National Commission to explore more effective means of dealing with drug issues in Guatemala.Finally, he expressed his hope that the 2016 UNGASS "will draw on these innovative experiences, and pronounce itself decisively for public policies that are subject to objective evaluation." In his speech at Columbia University, President Pérez Molina not only echoed his commendations of Colorado, Washington and Uruguay, but went one step further by advocating for a system of regulation of all drugs. Calling for "an open and honest discussion" to explore alternatives to the prohibition model, he described efforts to move the debate beyond Latin American by reaching out to heads of state of countries from other regions, including New Zealand, Portugal and the Netherlands, and also said that a discussion on drug reform was being planned at the World Economic Forum in Davos, Switzerland. Finally, in his speech at Columbia (though, notably, not to the UN) President Molina said that his hope was that the 2016 UNGASS would begin the process of amending the international drug control treaties to "take important steps away from prohibition." While Colombian President Juan Manuel Santos was more cautious than his colleagues, he reiterated that the "war has not been won," 52 years after the approval of "the Convention that gave the birth certificate to the war on drugs" and hence the need to evaluate "what we are doing and seek ways to be more effective." He underscored the importance of the OAS drug policy report and his expectation that it will be discussed in the UN in lead up to the 2016 UNGASS, concluding that with "a comprehensive vision devoid of ideological or political biases, we will be able to prevent much harm and violence!" That President Santos did not go as far as his colleagues in calling for a paradigm shift is not surprising given the complexity of the political situation at home, where tense negotiations with the Revolutionary Armed Forces of Colombia (FARC) guerrillas continue – indeed, that was the main focus of his UN speech – and with a potential presidential reelection campaign looming on the horizon. Indeed, some Colombian analysts have said that he is not likely to make any bold moves related to drug policy until after the May 2014 vote. In that context, it is significant that at this year's UN General Assembly meeting, President Santos made clear that he will continue to play a leadership role on the international stage in promoting debate on present policies and the search for more effective alternatives. What does all of this mean for the 2016 UNGASS? While four speakers out of 195 may not seem significant in terms of impact on the UN process, last week's statements to the General Assembly show that some Latin American leaders are starting to unite around a cohesive message – and to bring that message to the UN's doorstep. Their message is this: The work of the OAS can no longer be ignored. The UN – and the world – needs a new global strategy, which must emerge from an "open and inclusive debate" leading up to the Special Session of the General Assembly in 2016. Towards that end, this debate must include the voices of civil society and broad participation of UN agencies beyond the Commission on Narcotic Drugs. Only through such a process will the 2016 UNGASS offer an opportunity for fundamentally rethinking international drug control policy — an opportunity that some Latin American presidents have made clear they do not want to be squandered. Heather Haase is the New York consultant for the International Drug Policy Consortium (IDPC) and with the Harm Reduction Coalition. Coletta A. Youngers is an Associate with the International Drug Policy Consortium (IDPC) and a Senior Fellow at the Washington Office on Latin America (WOLA).